I’m a PhD candidate researcher in computer science who has been investigating the use of deep neural networks for classification and problem solving tasks. I saw a fun article about training a neural network on arbitrary data to generate novel sequences. For example, you force the network to read Shakespeare over and over and eventually it can write its own texts in the style of Shakespeare. I saw that and thought: hey, why not Magic cards instead of Shakespeare? So I downloaded the source code (here) and a json corpus of Magic cards (here). I decided to feed a deep neural network all of the Magic cards ever made in the hopes that it might be able to conjure up some new ones. 3, : Add 2 to your mana pool. Even if you know nothing about Magic, you know that paying three of something to get two of that same thing is a bad deal. 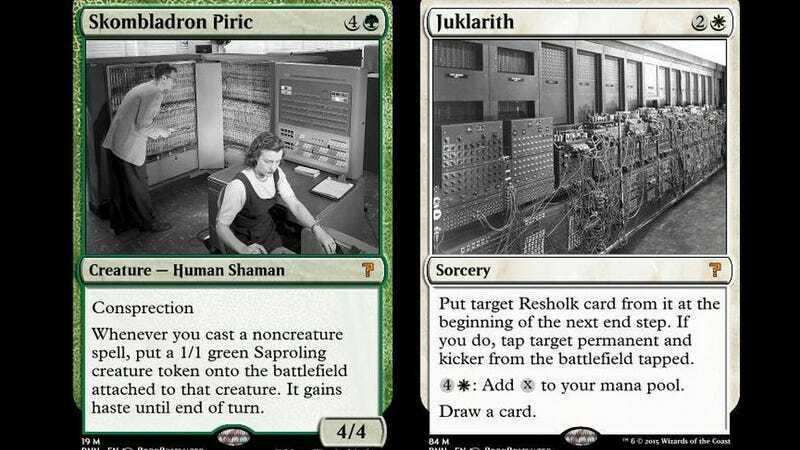 But things got really interesting when a Twitter account started rendering cards using some of the A.I.’s designs. Using the Twitter handle @RoboRosewater (a reference to Mark Rosewater, the actual human head of Magic R&D, who has himself joked about the A.I. ), the account posts a new card every day. Some are sublime. We need a rules revision that will allow Tark’s Flowstork to count as both spell types for Tarmogoyf. Some cards sound like Bono and Ronnie James Dio wrote a song together. A few are actually really good Magic cards. Maybe a little too good. I mean, not Mointainspalk good, but pretty good. On occasion the A.I. clearly seems to be trolling us. Read the last part of the card text carefully here.